Ranked No. 1 in TNS truck Track 2012 Total Customer Satisfaction study in the LCV Load and Mini Bus segments and joint No. 1 in the HCV (MAV) truck segment. Mahindra Navistar rolled out its 5000th truck on the 1st of June from its state-of-the-art plan at Chakan. Mahindra Navistar has been bagging achievements one after the other in a very short span. After winning the Apollo CV Award for HCV Truck of the Year, Mahindra Navistar has also been ranked No. 1 in TNS truck Track 2012 Total Customer Satisfaction study in the LCV load and Mini Bus Segments and joint No. 1 in the HCV (MAV) truck segment. Mahindra Navistar has taken up the challenge to change the Indian Trucking for the better and help it outperform. For this, they have created 1001 service points at strategic trucking locations across India and are many more are on the way. Supporting the nation’s Trucking Industry are 4500 trucks that are already plying the Indian Highways, having clocked more than 8 Crore kms. Speaking on the occasion, Mr. Nalin Mehta – Managing Director, Mahindra Navistar Automotives Limited, said, “Mahindra Navistar has today emerged as the new and viable alternative for the Indian trucking customers who have been experiencing status quo and inertia in a duopolistic market. As a challenger brand, Mahindra Navistar’s strategic intent is to challenge this status quo by not only trying harder but also trying out-of-the-box measures which can be summed up by the brand philosophy of “OK IS NO LONGER OK”. 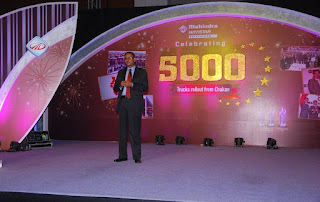 Mr. Mehta, further, added, “This is a landmark day in the history of Mahindra Navistar as it marks another very important milestone with 5000 trucks rolled out from Chakan Plant and with more than 8 crore kilometers behind us! This achievement reflects the ever increasing confidence of the customers in us. This also indicates that MNAL trucks are running on multiple applications across India. This would not have been possible without the support of the formidable service network of nearly 1001 service points on strategic trucking routes PAN India that includes 56 unique, large-scale 3S dealerships which are designed to cater to customers differently and that have become landmarks in the Indian CV industry”. Mahindra Navistar’s wide, strategically located network also includes 220 Authorised service points and 703 Roadside Assistance points in addition to 22 dealerships dedicated to LCV customers. Mahindra Navistar has also been the first to provide customer benefits like 4-years unlimited mileage warranty and 48-hour on-road assurance to exhibit confidence in their product quality and agility in service. This has helped MNAL to be No.1 in the TNS customer satisfaction. No.1 in LCV trucks & buses and Joint No.1 in HCV multi-axle trucks; all this being a strong endorsement amongst the customers across India in the Brand Mahindra Navistar. Continuing its promise to outperform, Mahindra Navistar also initiated the first-of-its-kind CV industry award to honour and recognize the heroes of the Indian transportation industry. The Mahindra Navistar Transport Excellence Awards were the first of any such awards in the Indian trucking. Mahindra Navistar has lived up to its expectations of Outperformance and will continue to do so in future too. Mahindra XUV 500 is the all muscular SUV with great performance, Mahindra and Mahindra witnessed an increase of 44 percent in the net profit for the fiscal year 2011-12. Recently the AGM of this Indian car maker Mr. Pawan Goenka revealed to the media, the company’s plans of launching six brand new models and also its expectation of a growth of around 10 to 12 percent in the average sales for the FY 2012-13. The company is planning on a capital allocation of Rs. 5,000 crore over the next three years and is also going to invest Rs. 2,500 crore in the companies of the group. The 5-seater Mahindra Xylo Mini, Mahindra Verito hatchback and Mahindra Reva NXR anticipated to be rolled out in the current year. The flagship Mahindra Scorpio SUV might start traversing the roads somewhere in 2014.